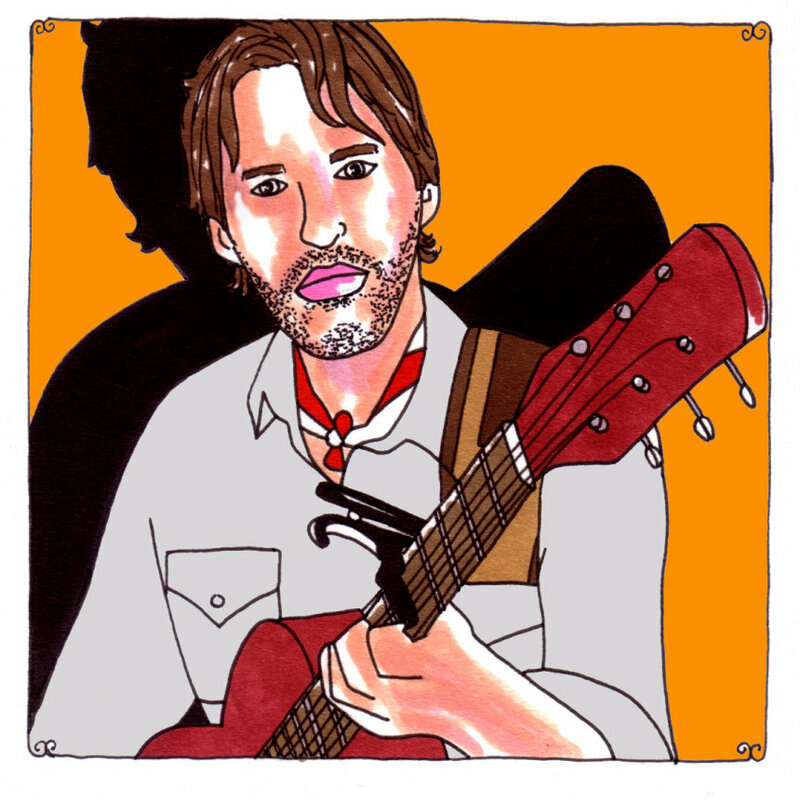 Words by Sean Moeller, Illustration by Johnnie Cluney, Sound engineering by Brett Allen and Nick Luca at New Monkey Studio in Van Nuys, Calif.
Dave Rawlings and Gillian Welch are, in so many ways, why we have music in the first place, or why it survives. They certainly weren't around when the first tune slipped out, when someone first discovered harmonics and the happiness and excitement that the right combination of notes, instruments and voices can scare out of a gathering of people, but their ancestors or ancestors of ancestors were and it's all been passed down since then and it lives in this couple. Rawlings and Welch (joined here in session with the great trumpeter Nate Walcott at Elliott Smith's old New Monkey studio) embody the playfulness, the seriousness, the somberness and the gorgeousness of what the best in songwriting always has. Of course if they ever married each other, they'd marry for a multitude of other reasons, of course they would, but no one think any less of them should they simply marry each other because their voices were meant to spend their lives together. Those voices were meant to be and cohabitate together and they were meant to grow old together, losing themselves to age along the way, sometime still in the very distant future. Rawlings and Welch sound as if they're in their prime on the debut album from Dave Rawlings Machine, a record that touches on countless different variations of a heartbreaking line of country thinking. There are sad lives and unfortunate circumstances, but there is always a central thought that it's just another day and it wasn't really all that horribly bad if it ended with a pitcher of beer, a bottle of wine and a soft pillow. The lyrical content of "A Friend Of A Friend," out on the couple's own Acony Records, takes us everywhere within the spectrum of honest, unfiltered feeling. It takes us to the places that we've been to and forgotten, to the places we're surviving currently and it offers remedies for getting through it all, for not being dismantled by the hard times or the lean times. It takes us to the song that Rawlings co-wrote with Ryan Adams, "To Be Young (Is To Be Sad, Is To Be High," which appeared on "Heartbreaker." Where Adams makes the song sound like an anthem, something to celebrate almost, Rawlings and Welch make it sound like a reflection, a take on a time that used to be that only exists in ancient memory for those who have settled into a different, more mature existence. The sadness is only relative anymore, still just as rough, but now maybe more par for the course and the highness isn't high enough or doesn't have the same exhilarating, escapist effect as it used to. It takes us to lovely times when money doesn't matter, or didn't matter. When the children run around the yard without shoes on their feet, oblivious to poverty, dirt on their faces and huge smiles across them, for real blessings they find every day - in the toad they catch down at the neighborhood creek or the first kiss in the twilight around left field at the little league field that didn't cost the two teenagers a thing. "How's About You," carries the grim sounding sentiments of these times, spackled with the beautiful old-timey way that Rawlings and Welch have managed to perfect over the years - on her phenomenal recordings and now on his. Rawlings sings, "Seems a lot of good people are gettin' bad news/I used to have a dollar, I'm gonna have a dime someday." It's not a worrisome claim or one of contempt, just one of reality. It's gonna happen one way or another so why should that be at all depressing? Rawlings has managed to make a bluegrass album that defines us, all of us, in some way. It's an elating example of what's meant to be when or worries drive us to drink and to chronicle them so that they can give others pleasure.